While the algal tide that is Donald Trump continues to sweep America, we can take comfort that there’s one place at least that’s not rolling out the red carpet. In his home town of New York, they hate his guts, if his reception at the US Open is any indication. Familiarity breeds contempt, it seems. Welcome to New York, Mr Trump. Now bugger off back to the campaign trail. At Flushing Meadows to see the two Williams sisters face off against each other, Trump took the crowd’s frosty welcome in his stride — and fell asleep mid-match. As they say in the classics, let sleeping dogs lie. The Don was also hosing down claims in the Washington Post this week that he cheats at golf. Sportswriter Rick Reilly reckons Trump is ‘an 11 on a scale of one to 10’ when it comes to cheating. Trump’s response? “I always thought he was a terrible writer,” he said, adding: “I don’t drop balls, I don’t move balls. I don’t need to.” Being so rich and devilishly handsome and all. Back at the tennis, the talk of the circuit is Roger Federer’s new shot. It’s a chip and charge — without the chip. It takes attacking the serve to ridiculous new levels. Don’t try this at home. Now Roger has revealed how he came up with the shot. Brainstorming with Stefan Edberg? Nup. End-of-career legacy innovation? Nuh-uh. Strategising to gain a new advantage over his younger opponents? Bup-Bow. Basically Fedex was jet-lagged to the wazoo and desperate to get off the training court heading into the recent Cincinnati Masters. So he took to half-volleying the service returns to shorten the points and… voila. But the best part is the name he has given his daredevil new play. SABR. Not as in let’s rattle the sabre. As in Sneak Attack By Roger. Bless. Also trying out a new move this week was Ohio State wide receiver Braxton Miller. Part ballet, part gymnastics, it makes Jarryd Hayne’s sidestep look downright pedestrian. With the Rugby World Cup kicking off next week, former coach Sir Clive Woodward has named England’s greatest threat. And it’s not the All Blacks. It’s not any of the other teams. It’s Twitter. Yes, poor ol’ Clive stays up nights worrying about the dangers of ‘one stupid tweet’. “If you allow one player to be distracted, it can all come tumbling down,” he says. I reckon you should worry more about the All Blacks, Clive. England was doing an excellent job bringing itself undone in the cricket. During the one-day series with Australia, Ben Stokes did a Maradona and tried to handball away a run-out attempt. All hell broke loose when he was sent back to the pavilion for obstructing the field and for a while it looked like our respective Prime Ministers would be calling in the troops. I just think Stokes was looking for entertaining new ways to get out. I mean, who can forget his Ashes run-out when he made his ground with feet and bat still airborne? While we’re on the subject of cricket numpties, we can’t let Shane Watson’s retirement from the Test version of the game pass without comment. Watto says he no longer has the drive for Test cricket. Or the hook. Or the pull. Or the cut. Or the sweep. Or the leg glance. Or the basic defensive block. 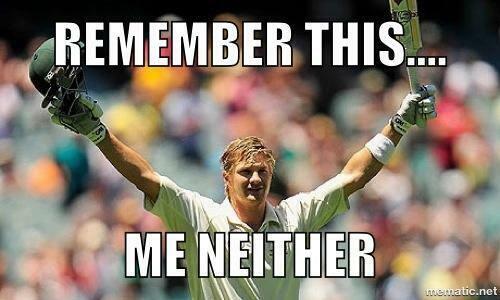 But seriously, we should give Watto a proper send-off for his immense contribution to the game. So I’ve painstakingly cut together this 10-hour career highlight video for your viewing pleasure. Enjoy. Have a good weekend, everyone. Add to you highlights reel.